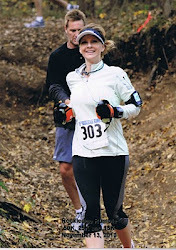 This weekend is Whispering Pines 50K in Tyler, TX and I could not be any more excited! A long weekend with friends running through a pine forest for hours on end? The perfect weekend! I am thinking of trying something a little new with my fueling for this race. As much 'real food' as possible and the least amount of sugar is what I'm aiming for. Nothing crazy-- I know potatoes work well for me in ultra's so I am going to cook up a big pot of mashed potatoes tonight and put them in the refrigerator. Tomorrow I'll mix in some coconut milk and an egg or two and form some potato cakes that I will cook in a sprayed skillet. Tucked into a ziploc bag I think they will work well in my drop bag that I will have access to twice during the race. I'm thinking I can grab one and eat it on the go. Instant carbs and a little protein with the egg. I've already figured out that a banana wrapped in a gluten-free tortilla with almond butter and roasted sunflower seeds works well for me before a long run, so I'm adapting that a little bit and going to substitute a sweet potato pancake for the tortilla. Too much fiber? We'll see... Any thoughts? There will be oranges, bananas and PB&J's at the aid stations, and I'll take some GU and Sport Beans along in my pack in case I get in a bind and need sugar. If you're not racing per definition, I think it's a great idea for testing things out. You will be fine getting through and rumor is, may have no big dips or high's. The energy might not be booming enough to propel the speed much, but I think it's an interesting experiment. Hey, science on trails is fun! Scott Jurek used sweet potato (baked) in a baggie, may be a touch of soft avocado mixed in. Banana mashed with PB totally rocks. I don't like to chew, personally, but other than that, will be waiting on report. Thanks Brian! Somehow it's October and I haven't ran a a 50K all year. I'm excited but a little nervous! Sounds yummy!!! I know that when I go long my body craves crap. Sugar, sugar, sugar. But only up to a certain point (about 8 hours in) and then I get sick of sugar and want other stuff. I will try these for the 24 hour race for sure!! Please let us know how it goes!!! Good luck in your race! 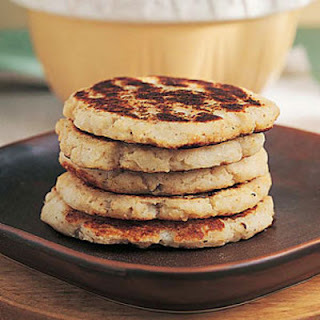 The potato cakes look great. I might have to try them myself.